The State Wildflower license plate has raised more than $4.2 million for Florida’s native wildflowers, wildlife and wild places. Established more than 400 school wildflower gardens that let children experience and learn about nature. Planted and protected hundreds of acres of wildflower pollinator pathways on roadsides. Increased environmental awareness in more than 2 million people throughout Florida. Every day, the State Wildflower plate touches thousands of residents and visitors through environmental education on social media and the Florida Wildflower Foundation website. It funds university students performing valuable research, makes possible grants for public places, and much, much more. 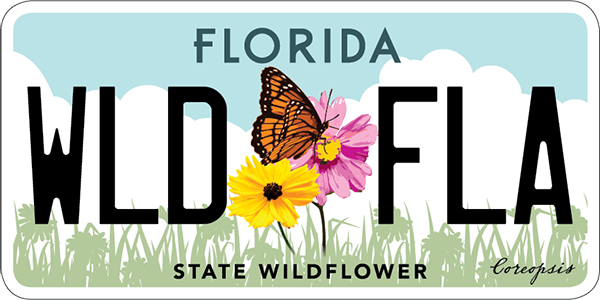 Help protect and preserve native, natural Florida — get your State Wildflower license plate today! The redesign of the State Wildflower license plate went on sale in October 2018. The State Wildflower license plate’s original design is no longer available. Launched in 2000, the plate has raised more than $4.2 million for Florida’s wildflowers. When you purchase and renew the State Wildflower plate, an annual $15 specialty plate fee is collected and given to the Florida Wildflower Foundation to fund work for wildflowers and wildlife throughout the state. To view the total cost of switching to the State Wildflower plate, click “What does the State Wildflower plate cost” in the Q&A menu (below). Plate owners are Florida Wildflower Foundation members and receive member benefits. Register your membership here. The original State Wildflower license plate design was 19 years old in 2018. The fresh new look draws attention to the vital link between pollinators and wildflowers. The new design depicts two species of Coreopsis, Florida’s state wildflower, with a butterfly. The yellow flower is Coreopsis leavenworthii, (Leavenworth’s tickseed). The pink one is Coreopsis nudata (Georgia tickseed). Both are Florida native wildflowers. The design was created by Caley Curchy of Lake Wales, Fla. I have the old State Wildflower design. How can I switch to the new look? License plates have a life expectancy of about 10 years. When your plate reaches that mark, your county tax collector’s office will automatically send you a new State Wildflower plate, which will have the new design. For example, if your State Wildflower license plate was issued to you four years ago, you can expect to get a plate with the new design in six years. If you’d like to switch to the new look before then, fill out this form to receive a phone call from the Indian River Tax Collector’s office, which will process your request no matter where in Florida you live. Or visit your local tax collectors’ office. I have a typical State of Florida plate. How can I switch to the new State Wildflower plate? Simply fill out this form to receive a phone call from the Indian River Tax Collector’s office, which will process your request. Or visit your local tax collectors’ office. What does the State Wildflower plate cost? These three options include a $15 specialty tag fee received by the Florida Wildflower Foundation to fund work for wildflowers. Each annual renew of the plate will include your registration renewal fee and a $15 specialty tag fee received by the Florida Wildflower Foundation. * Mail fees are $3.75 and are not applicable should you visit a tax collector’s office. Can I request the State Wildflower license plate when I am buying a new car? Definitely! Ask your dealer to order the State Wildflower plate for your car. You’ll be given a temporary tag to display until you receive your new plate by mail. What does the Foundation do with my donation? The Foundation uses the donation to fund native Florida wildflower research, education and planting/conservation projects. Your donation also includes a Florida Wildflower Foundation membership. What if I want my State Wildflower license tag now but my present tag hasn't expired? You can purchase a State Wildflower tag at any time. Simply fill out our form to purchase your plate by phone, or visit your county tax collector’s office. However, you will pay an additional fee to switch plates. Can I purchase the license plate as a gift for someone else? Yes! You have two options. To order a plate for your recipient, fill out our online form to receive a call from the Indian River Tax Collectors office, which will handle the sale. You’ll need a copy of your recipient’s present auto registration. Visit your local county tag agency and request to purchase a State Wildflower gift certificate to give to your recipient. Click to learn more about the gift certificate program. I went to my tag office, but I did not see the State Wildflower tag on the wall or in the license plate samples book. Florida has more than 120 specialty license plates, so it can be difficult to find the State Wildflower tag among them. Just tell the clerk you want flower power – the State Wildflower license tag! I have a personalized “vanity” tag. Can I still get the State Wildflower license plate? Yes. The State Wildflower tag’s center-logo design can accommodate up to seven letters and a space or hyphen. Learn more about personalized tags. The State Wildflower plate makes things happen! Learn how to succeed with larger scale native wildflower plantings. This event combines a guided instructional walk through Florida native plantings at Bok Tower Gardens with a classroom course reviewing the species used as well as planning and installation processes. Renowned upland restoration expert and native plant horticulturist Nancy Bissett of The Natives will lead the walk and provide the classroom instruction.